It took awhile, but I finally had fun in OVERKILL's The Walking Dead. The game is a new four player co-op shooter out now on Xbox One, PlayStation 4 and PC from the makers of the PayDay series. While everyone's mind immediately goes Left 4 Dead, the game is anything but. 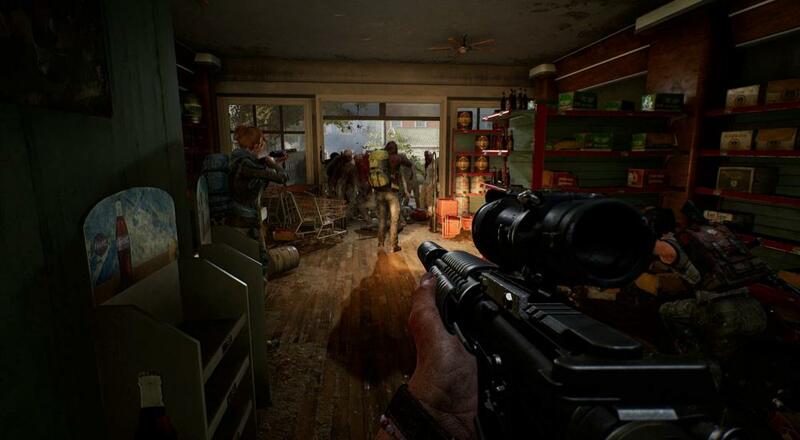 The first mission actually plays a bit like a round of Call of Duty's Nazi Zombie mode, where defense building and teamwork are crucial for success. It's honestly nothing to write home about, mostly because you are given weak guns against overwhelming odds and its as frustrating as it is unfun. But once we established our base of operations and hit the second mission, "Hell or High Water," that we started to see the game's stride. Gone was the run and gun and in place was a slow, methodical trudge through a southern town to find a water filter. Hordes of zombies were everywhere, but aren't aggressive unless provoked. And then, the humans show up. So what happens? Watch below to find out. Page created in 0.9326 seconds.